The Best of Teacher Entrepreneurs II: Revolving Moon in Your Classroom! The phases of the moon can often be difficult to understand (and teach!). I have made a unique moon box with a revolving moon so that students can see exactly how the phases of the moon occur. It's made with very simple materials and is very effective. I haven't seen one before. This unit is packed with unique activities that will really excite and bring to life the wonderful science of the moon. There are 8 science stations in this product. The first station "CREATE IT" is optional depending on how much time you can spare. This moon box with a revolving moon is unique I believe. It's a fantastic way to show the phases of the moon as it rotates around the earth. It's also great for guided discovery. "DRAW IT" - this station gets the students to draw the phases of the moon that they see in the moon box. An answer sheet accompanies this. 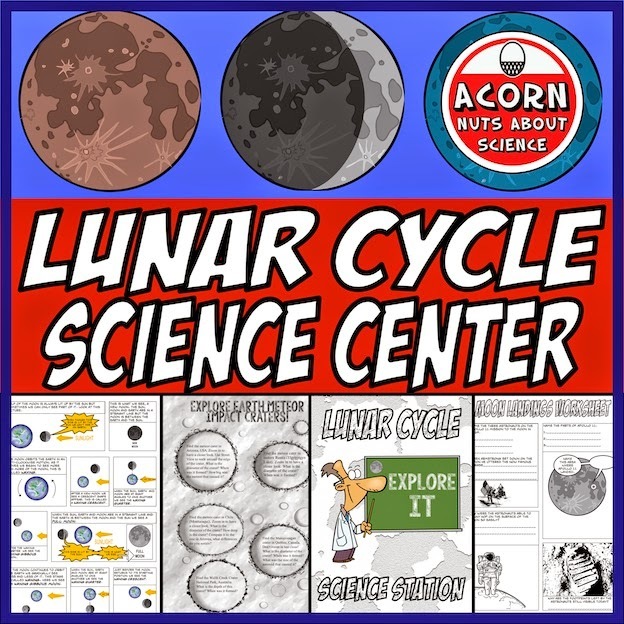 "READ IT" is a comic book style station where the students read a short explanation of the lunar cycle. This is accompanied by a worksheet where the students shade the lunar phases and label them. This builds upon the learning in the previous activities but can easily be used as a stand alone activity. "SORT IT" is a really fun station where students have to sort out the lunar phases cards in the correct order. This is a beat the clock activity. In the "RESEARCH IT" station the students watch a short video on the moon landing and then read the article that accompanies it. Another short text and worksheet accompany this. "EXPLORE IT" is a great activity where the students can see if there is any correlation between meteor size or speed and the impact crater formed. In "TECH IT" the students go online to locate meteor impact craters on earth. A worksheet accompanies this. "WATCH IT" here students go to a website and watch a short presentation on the moon. An online quiz follows.